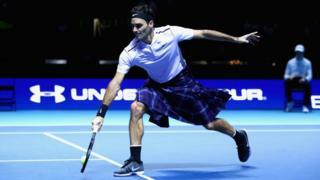 Roger Federer donned a kilt as he beat a tartan-hat wearing Andy Murray during a charity event in Glasgow. The match was the first time Murray has played in public since suffering a hip injury at Wimbledon.The pair did not appear to be taking things too seriously with Federer playing one game in a kilt borrowed from a female fan.Murray then sported a Tam O'Shanter or "see you Jimmy" hat produced by his Swiss opponent.World number two Federer had earlier spoken of being welcomed to Scotland with shortbread made by "Andy's granny" and a can of Irn Bru. He tweeted a picture of a biscuit tin an open can of the famous Scottish fizzy drink and wrote: "Can't get a warmer welcome than this. Thanks @andy-murray ... is this your usual pre-match routine? "Murray replied: "Yea that's a good start but try a deep fried Mars bar on top of that and you'll be properly ready @rogerfederer. "About 11,000 fans packed the SSE Hydro in Glasgow for the Andy Murray Live exhibition match. The Scot lost 6-3 3-6 10-6. During an interview after taking the first set, Federer joked: "If anyone brings me a kilt, I will put it on. "A female fan then appeared at the side of the court willing to give him hers.Later Murray put on a tartan hat Federer presented him with midday through the tie-break.Speaking about his own tartan attire, the Swiss player said: "What impressed me was how quickly the kilt was organised." "When I took it off I felt naked because it was nice and snug and heavy."